What makes people happy? This is a difficult question, particularly when one considers that there is a growing trend in some policy circles to emphasise happiness as a goal, instead of concentrating efforts on making people richer. The BBC even broadcast a series looking at the new science of happiness. So, if happiness is entering the realms of scientific research and policy-making, we have to determine how we can measure happiness, or even trying to determine if such thing is possible. Do you simply ask people? Organise surveys? Measure happy thoughts? Vanuatu? This is a country famous for being a tax haven, hosting KaZaA and being the online pharmacy capital of the world. Internet hosting haven equals happiness? Well, maybe. Costa Rica is number three, and we are a gambling website hub. Of course, I’m a bit depressed about these news, because while all my fellow Costa Ricans are having a happy time, I’m stuck in cold Edinburgh. Where did the UK come? 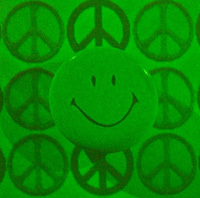 Violence, drugs… but happy!! = Colombia! Me he matado de la risa con tu comentario de la depresión.!!! Aquí en Venezuela hay un sol hermoso y de vez en cuando alguna lluvia torrencial. Suerte en UK!! !